Hello and Welcome to my fourth Daily 5 blog post! I hope that you have enjoyed my previous posts about general Daily 5 set up, Read to Self, and Word Work. If you missed them, simply click the links below to catch up! This post about Work on Writing is the most challenging for me to write. It is definitely the area in which I struggle the most in my own teaching and in my Daily 5 routines. My literacy instruction time is broken up throughout our school day. Last year, my students had 20 minutes of Work on Writing time everyday after lunch. We have a separate block of time in the afternoon for Writers Workshop. During writers workshop, we focus on more "project-based" writing including narratives, informational writing, opinion writing, how-to books, poetry, etc. For my students, work on writing tends to focus more on conventions, ideas, and organization. 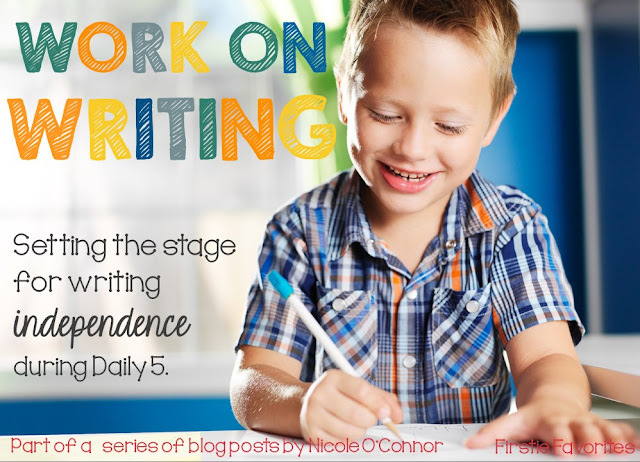 I will begin by explaining how I set up Work on Writing at the beginning of the school year. Over the last couple of years, my first grade team has experimented with different types of paper/notebook options for work on writing. We decided that it was helpful to have students write in a notebook for easy organization purposes. We also soon discovered that our little first graders struggle to organize their writing/illustrations in a standard wide-ruled notebook. At the beginning of the year especially, students are not able to fit their handwriting in the small lines. They also struggle with how much of the page to use for their pictures, where to begin writing, etc. When we spoke with the second grade teachers at our school, they had found a wonderful solution to that problem. The second grade team had ordered a composition notebook for each student with handwriting lines on the bottom half of the page and a space for an illustration at the top. We have ordered these composition notebooks as part of our budget for the last two years and I LOVE them! Here is a link to the notebooks on Office Depot's website. Since we order through our school district, we can use the Business Office Depot prices and the notebooks are only $0.96 each on the business site. I highly recommend looking into them! Just like with Read to Self, I begin with an I-Chart of our Work on Writing expectations. The Sisters recommend making the anchor chart with your class, but I have found it to be cumbersome and time-consuming. I typically have the chart prepared ahead of time and I briefly go through the expectations with my class. Unfortunately, I do not have a picture of my Work on Writing I-Chart at this time. It is currently in my classroom, which is being cleaned at the moment. I will include a picture of it as soon as I can, but here is a list of my student expectations that I include. The biggest part of beginning Work on Writing is modeling the writing process and building writing stamina. I model the writing process out loud for them on the carpet. I begin by putting the date at the top of the page and modeling how I sound out words as I write. One of the key factors in guiding students to be independent writers is encouraging inventive spelling. I tell students to "underline tricky words" in their writing that they would like to revisit later and keep writing. At the beginning of the year, I focus on spacing, punctuation, and correct letter formation in my mini lessons so I model this thought process out loud as well. Then, I set them loose. Students are always sooooo excited to write in their notebooks for the first time. On our first day of Work on Writing, we write for 2 minutes (using a digital timer on the projector) and then we regroup on the carpet to do a "check in." I go through all of the expectations on the I-Chart and students give a thumbs up, thumbs to the side, or a thumbs down for each expectation based on how they think they did. Then we go and do two more minutes of writing. To track our writing stamina, we fill in our stamina meter after each successful work on writing session. Grab my stamina meter freebie by clicking this link! During work on writing, I check in with students about their writing. We discuss their writing and I provide instruction on conventions, organization, and ideas. One of the things that I struggled with during my first few years of Daily 5 was feeling like I wasn't getting to students as often as I wanted to give them individualized instruction. Last year, I started had a realization that changed my work on writing time significantly. I realized that many of the skills that I was teaching during work on writing were very basic. I started using 3rd grade writing mentors in my classroom. Beginning in January, I invited a few of my former students back into my classroom during our work on writing time. I chose students who were strong writers and leaders. These third graders chose to give up their lunch recess twice a week to come in and help my young writers. I gave each third grader a Writing Mentor Folder with a writing checklist and a few other resources (sight word list, blends and digraphs chart, etc - There are MANY resources available out there - I think I found these for free using Pinterest). When the third graders came in, they grabbed their folder, a pencil, and a timer. They called over the next student on their list and had the student do some writing with them. After about 5 minutes of supporting that student with their writing (focusing mainly on basic conventions and generating ideas/details), they took a closer look at the writing with the student. Together, they set a writing goal that the student would continue to work on. Then the third grade mentor wrote the goal on the paper next to that student's name. The writing mentor process was wonderful!!! I absolutely loved it and so did my students. These third graders were a wonderful resource for me and my little firsties. Of course, choosing mentors who are strong leaders is the key! I highly recommend a process like this for writing support in your classroom! Another way that I spiced up our Work on Writing time was opening up our writing center. Every two weeks, students got a turn to visit the writing center, where they got to write letters, postcards, short stories, lists, etc. Here's a previous post that I wrote when I put together my writing center. Occasionally, I also included some of Cara Carroll's Work on Writing activities at my writing center. I LOVE them! My school district recently adopted the Handwriting Without Tears curriculum. Unfortunately, I really only have time to complete it twice a week, but I LOVE the way that handwriting is taught using this curriculum. Please click this link to learn more about Handwriting Without Tears. My favorite part of Work on Writing is our Friday Writing Portfolio time. Each week, my students respond to a writing prompt. My students keep these portfolio writing samples in a binder, which is very exciting for a first grader! They take this writing very seriously and it is a wonderful assessment tool for me. 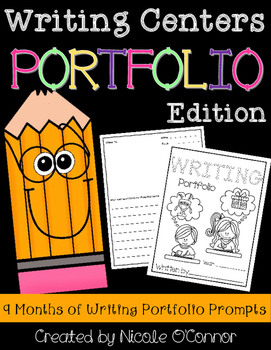 Here is a link to a previous post that I wrote about our writing portfolios. It will tell you everything that you need to know about setting them up in your classroom! Throughout the year, we celebrate students progress through a "portfolio showcase." Students show the class their first writing sample, followed by their most current sample. Students comment on improvements that they see in the writing. For a direct link to my Writing Center: Yearlong Writing Portfolio, click here. Well, that's all I have for you about Work on Writing! I hope that you found this post to be helpful. Work on Writing is definitely still a work in progress for me. Please feel free to comment with any helpful tips that you have for fostering independent writing in your classroom! Stay tuned for my next Daily 5 post... up next is Listen to Reading!